It’s easy to compare William Tenn’s 1968 science fiction classic Of Men and Monsters to Jonathan Swift’s Gulliver’s Travels. Set far in the future, Of Men and Monsters describes life on earth after a race of Brobdingnagian sized aliens have colonized our planet. Unable to defeat the invading species, humanity has been reduced to living inside the walls and floors of the new dominant species’s homes, scavenging off the giant, six-legged aliens. Think, The Borrowers writ very, very large and crossed with John Christopher. While Jonathan Swift made his satirical points comparing the habits of Brobdingnag’s giant citizens with humanity, Mr. Tenn builds his satire by looking at the humans who now live within the walls of the alien homes. Of Men and Monsters follows the life of Eric the Only, later Eric the Eye, who comes of age after making his first theft, stealing something of value from a monsters. Eric’s tribe, called Mankind, is made up of Ancestor Science followers. Other tribes are followers of Alien Science. Both groups live within the walls of the same building– two communities in direct competition with each other although they are both sworn to strike back at the aliens who invaded many generations ago. The book works very well as an adventure story. Eric is a compelling enough character. The journey he takes through parts of his world he has never seen before makes for a very good read. The fact that his journey takes place within a single alien dwelling serves to make the book even more interesting. I had as much fun reading about the various human communities that live within the walls as I’m sure Mr. Tenn had writing about them in the first place. Of Men and Monsters never becomes a complete page-turner, but it does keep events flowing at a quick pace building up more than enough narrative tension to satisfy anyone looking for a diverting read. While Mr. Tenn does take time to make sure the reader gets his more satirical points, this comes in small enough doses to keep from overwhelming the plot. It’s easy to see that he is comparing humanity to rats which wasn’t a new idea even in 1968 when the novel was first published. His future simply takes a much more literal look at the analogy than anyone I’ve ever read before. While Robert O’Brien’s classic children’s novel Mrs. Frisby and the Rats of NIMH came out three years later and closely follows the plot of Of Men and Monsters, I’ll have to leave it to others more knowledgeable than I am to establish a link between the two books. I can say that if you liked Mrs. Frisby as a child, you’ll probably enjoy Of Men and Monsters as an adult. I did. Unless you’re a feminist. If you are, then you’re likely to find Of Men and Monsters frustrating. Ana, who blogs at Things Mean a Lot, pointed me towards two excellent pieces in her favorite posts of 2012 article. In the first Renay of Subverting the Text looks at the coverage of women authors on Science Fiction/Fantasy blogs and finds about what you would expect. In the second Foz Meadows of Shattersnipe: Malcontent and Rainbows argues that stories are genderless. Both are worthwhile reading, and both left me thinking in general about issues of gender, specifically about issues of gender in science fiction. 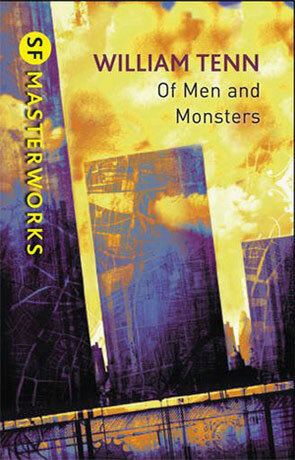 Looking at Of Men and Monsters with this in mind, Mr. Tenn does not present a very hopeful future for women. In his book women have a position of some respect within the tribes of humans–they are the knowledge keepers, the ones who take the raw materials and technology the men find and make useful objects. However, gender rolls are clearly defined in all groups: women are never allowed leadership positions, their primary purpose is to bear children, and they must submit to the will of their mate (always a male) whether he be worthy or not. Mr. Tenn’s future looks a lot like the distant past. Sometimes men would trample on women and mock their hurt, sometimes women would trample on men and mock their hurt. While I do believe we should critique the book the author wrote, not the one we wanted him to write, someone writing in 1968 really should have been able to see the situation of women throughout human history in a more thoughtful light than that. However, there is still much to enjoy in William Tenn’s Of Men and Monsters. Not the least is the way he envisions mankind finally travelling to other planets. In the future, if mankind is reduced to the position of rats, then mankind will travel to new worlds the same way rats did. It makes for a very funny, if slightly disturbing, ending. I first published this review on my old blog, Ready When You Are, C.B., several years ago. I still think this book is well worth a read, if you’ve never read it and you’re a fan of the genre. But I don’t think it’s one I’ll be rereading in retirement, though I am keeping my copy. I do like those Gollancz covers.